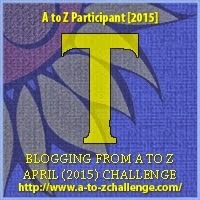 David Powers King: The WOVEN A to Z Challenge: T is for Thimble! The WOVEN A to Z Challenge: T is for Thimble! Update: Al's done an amazing job, guys. Due to gallbladder surgery (you realize how big a dragon's gallbladder is? ), Al has called on his dwarfs to help with some of the remaining days of the challenge. I believe Tassin is responsible for this one? Not bad for a dwarf! Thimbles serve as a protective element, one that traditionally prevents fingers from getting pricked by a needle. But as a tool in a fabricator's sewing kit, they are used to protect against physical harm and some forms of magic, so long as they stay in the holder's possession. Keeping a thimble in your pocket, or on a chain around your neck, will keep you safe. Rely on it too much and its magic will wear thin. I'm David, and "keep that kit with you ... especially that thimble." Wow, Al really outdid himself with the details on that thimble! Ug. Gallbladder surgery. Been there, done that, and it wasn't fun. I hope he feels better soon. I love thimbles! I used to collect them. When I was a kid, I thought they were magical. :) I love the details on this one. So beautiful! I had my gallbladder removed years ago. Hope he feels better soon! Such a tiny utilitarian thing, thimble, but it does symbolize so much--both in real life and in your story. Thimbles are very useful, especially when all you know how to do is a bit of hand sewing. Hope Mr.Dragon is recovering quickly and easily. That's an intricate thimble. Beautiful detail. Wow. That is an amazing drawing. Love the detail. 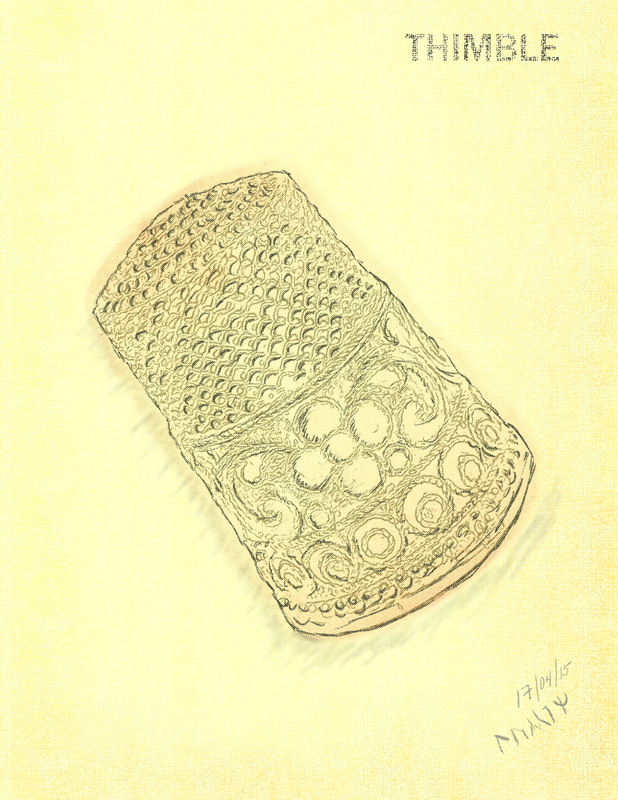 A very beautiful thimble. They are useful when sewing. I didn't know they carried luck, as well. That's a gorgeous thimble. I have my grandmother's thimble collection (she was a professional seamstress), and it is one of my greatest treasures. Maybe that's why I'm so darn lucky! Having that big a gallbladder makes it easier to spot, right? What a cool use for a thimble. I absolutely love the design. That's a great thimble. Mine is much more utilitarian. I want one of those! Never realised Tassin was so talented. I would love a thimble like that. Particularly if it was a magical one. I think I read about it in Lord of the Rings :) Beautifully drawing.